Ok, ok, I totally made that up. As I made her up. 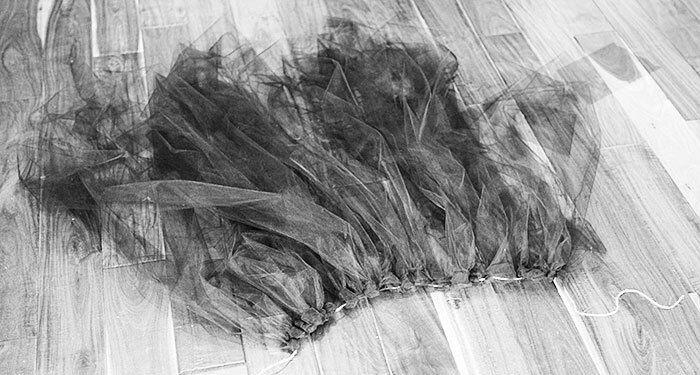 Of chicken wire and tulle and stuff. Here is how I made her. Oh and before I forget: wear leather garden gloves for this type of project. 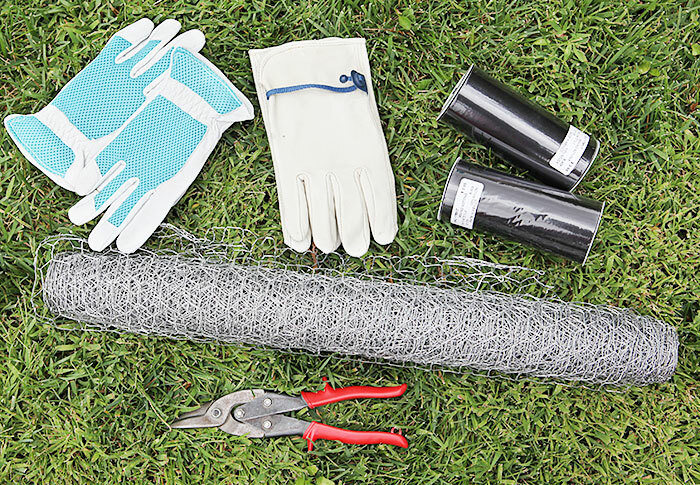 That chicken wire is out to get you. 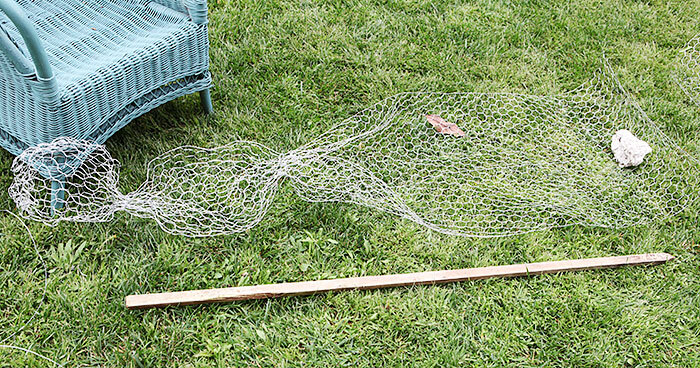 I unrolled my 2 ft by 25 ft of chicken wire. I used some rocks to make it lay flat. It really wants to roll back into a roll. 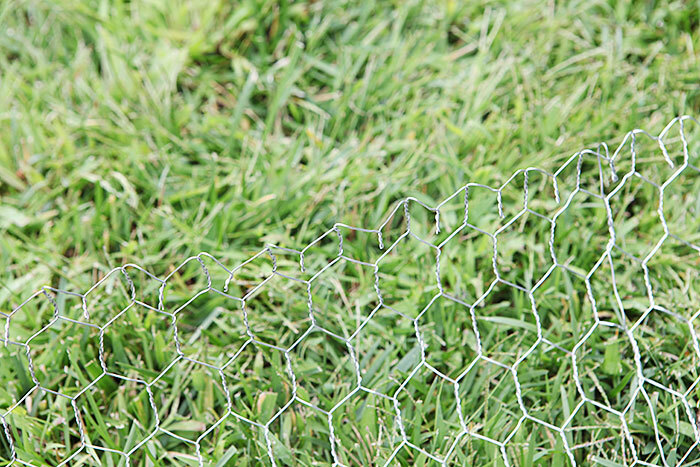 Chicken wire is introverted, I think. 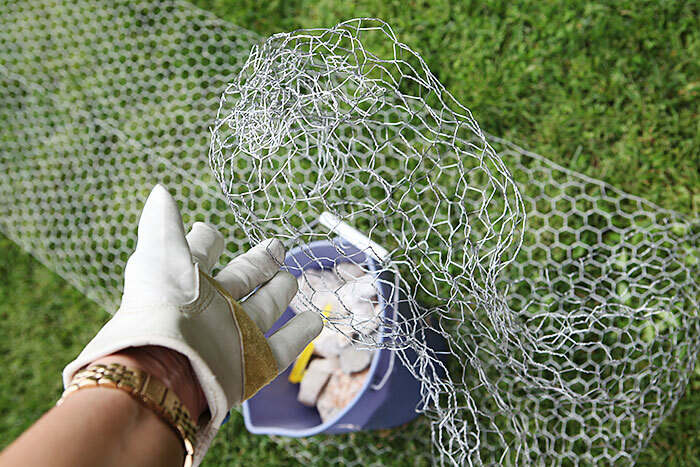 I made sure that whenever I cut pieces of the chicken wire off, that I would bend back the pokey ends like you see in the above photo. The shaping itself is kind of free form. First I curled the end around to make a tube, then I narrowed her neck, then started pulling on the top of the tube to form a head like you see here. 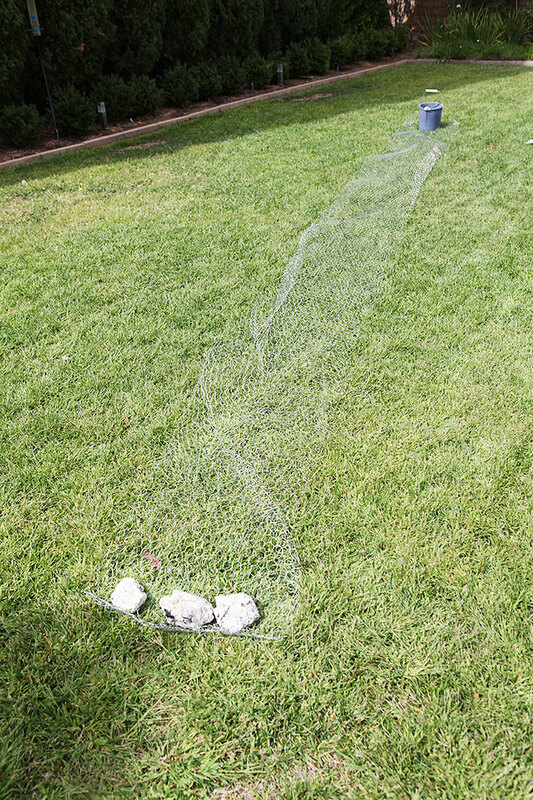 I used the rocks to keep the chicken wire in place. Next, I formed the torso and fetched myself a garden stick. I tied her neck with wire so it was too narrow for the stick to go through. I then tied her waste with wire, but a bit looser so the stick could pass through. Then I propped her up on the stick and cut off the chicken wire at the bottom to form the first part of her skirt. I cut two more lengths for the skirt, narrowed them at the waist and tied them below the torso of my fair lady. She didn't mind. 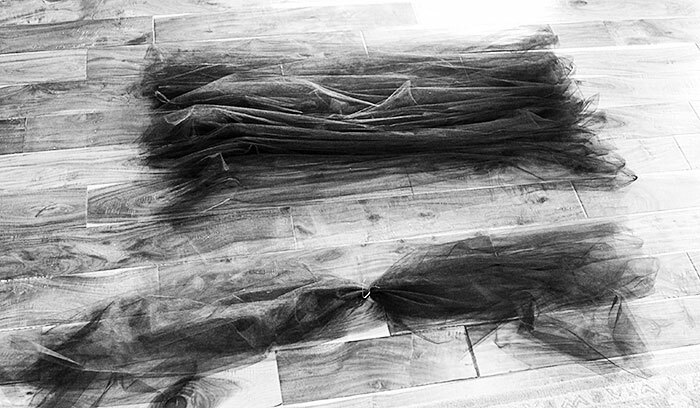 I used three rolls of black tulle. Two of the rolls I used to make into her skirt and one I used for her hair. The hair is made of long pieces with a piece of wire in the middle of it attached to the top of her head. Fancy. Each of the tulle pieces for her overlay dress is knotted to a piece of string like you see here. Next, I draped my 5 yards of thin fabric starting at the skirt then going around, then over her torso and her head. I secured the fabric in about 6-8 places with small pieces of wire. Over that, I tied the overlay dress made out of tulle strips. 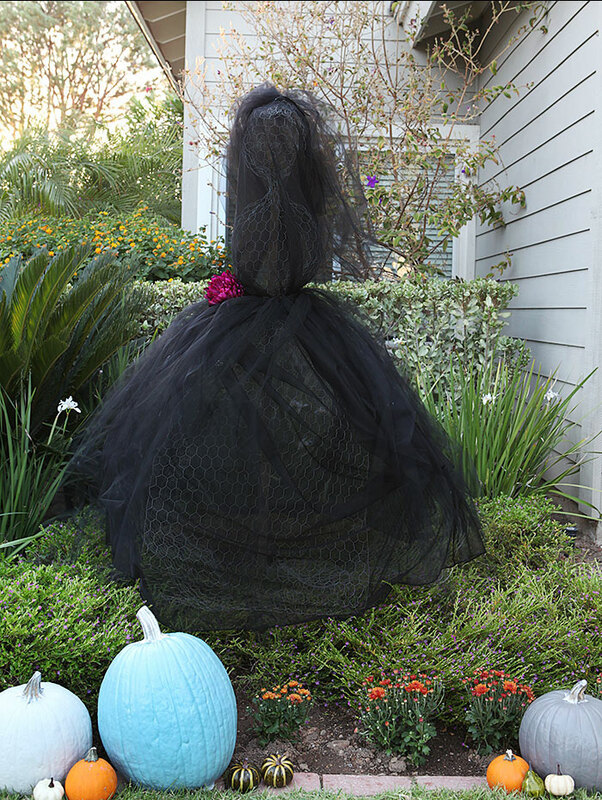 It looks spooky and kind of awesome when the wind catches the tulle. Finally, I added a purple forever mum to her waste line. Because she deserved it. Looking for more Halloween/Fall inspiration? Make sure to check out these other Wicked Craft Week Projects. 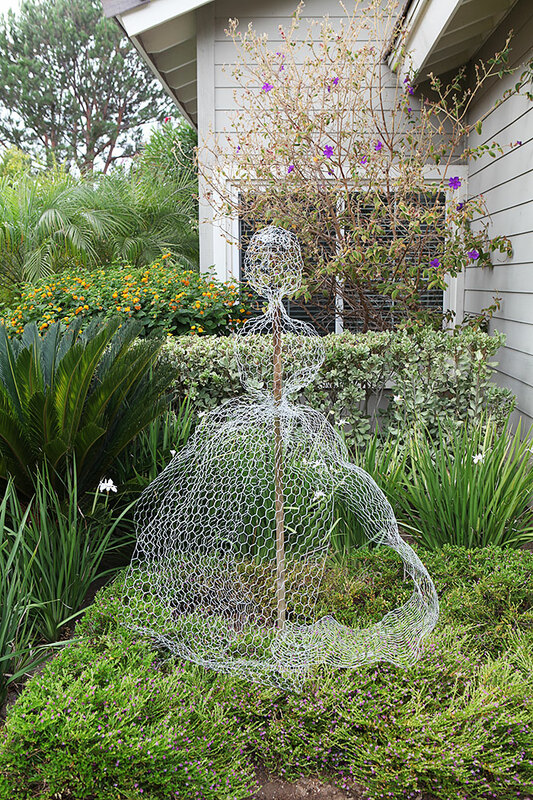 super cute and very imaginative!...also I'm a little bit scared of chicken wire now, haha! This is perfectly spooky - just awesome for Halloween and a great way to add some visual interest for the month! Love it, Katja! Super spooky and scary in all of the right ways! You are so creative! Love this. The most beautiful scary thing ever! It's awesome!!! So creative. 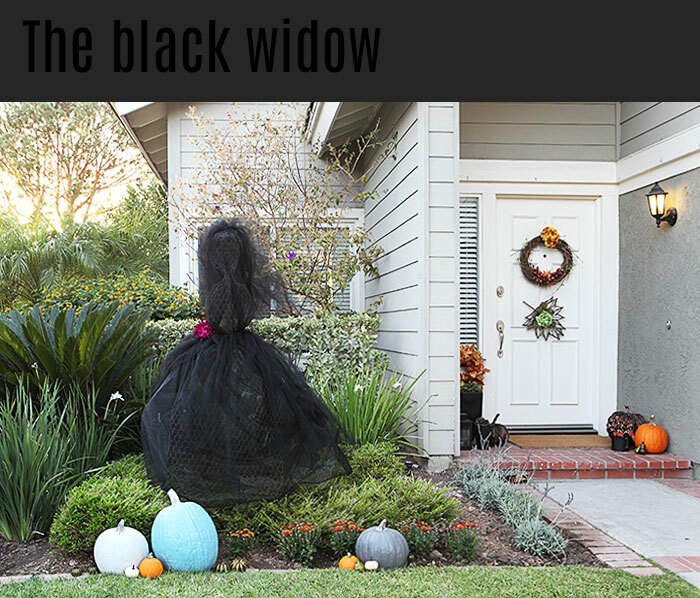 You must have the best Halloween-ready house on the street! Katja always has the most creative projects! This one is suuuuper creepy. :) Great post! Nice! Very creepy. Creative idea! OMG katja- that is AWESOMe!!!! i love how creepy it is! Wow! That's fun. Happy Halloween! So fun! What a great idea Katja!